Another huge turn out of teams were greeted with a particularly unpleasant day and a declining forecast which would have a chaotic affect on the days results. 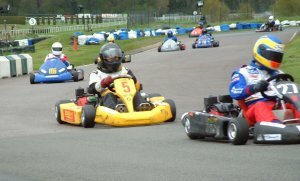 The top three qualifiers were Fabcar.co.uk, JKP Racing and Palmer Racing but by the time they all lined up for the start, half the field were on slicks and the other half of the field were on wets. 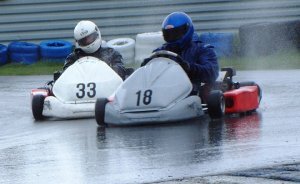 With nearly 40 karts circulating on an only just damp track, a dry line soon appeared, sending those on wets scurrying back to the pits. That done and only 15 minutes into the race, a heavy down pour occurred sending more teams back to the pits to change their slicks. Within half an hour of the start there was total confusion and Misfits found themselves at the top of the leader board followed by Teamworx, Stormy Normans, Spin Doctors and Lost Boys. The first of the big guns to show were Lakeside, Kartoon and Team Zaremba, with pole sitters Fabcar back in 15th place. Although Misfits had read the conditions right and were still leading, Zaremba, Team X and Lakeside were closing in on them and lapping considerably quicker. Lost Boys, Spin Doctors and Stormy Normans had surprised themselves by holding their top ten positions and teams on the move were Pro-Gem and Gas'n'Go. As the first fuel stops approached, Team Zaremba and Team X had predictably hit the front with Lakeside and Pro-Gem leading the chase whilst pole sitters Fabcar had moved back into the top ten. With two and half hours gone, the track was threatening to dry again, Team Zaremba and Team X were locked together at the front whilst Gas'n'Go had established a safe cushion in 3rd place from Kartoon, Lakeside, Pro-Gem and Fabcar. With the second fuel stop imminent Team Zaremba and Team X were a country mile clear of the rest of the pack but concerns were now for the teams degrading wet tyres on a rapidly drying circuit, whilst heavy rain clouds loomed on the horizon. With an hour and three-quarters to go, Team X had just got the better of Team Zaremba but by only a couple of seconds and the threatening rain clouds let go with a vengeance. With fading fuel and tyres, Team X were forced to pit first and got caught up in the pit chaos whilst Zaremba held on for 15 minutes, until the pits had quietened down, but were putting in some appalling lap times with tyres that were shot and circuit that was all but flooded. Team Zaremba had won the strategy battle and came out some seconds in front of Team X and with a kart more suited to the saturated conditions. Gas'n'Go were holding on to 3rd but Pro-Gem, Lakeside and Fabcar were all still on the same lap with just an hours racing remaining. Still in the top ten and putting on a good show were Focus, Misfits, JM Sport and Lost Boys whilst the telling conditions, amongst other things, saw Kartoon, Jerkboyz, Pogue Mahone and Ambrose retire before the end of the race. With just half and hour to go Team Zaremba had pulled well clear of Team X, but Gas'n'Go were fighting for 3rd with Fabcar who were putting in a very fast finishing stint. With the chequered flag in sight Team Zaremba took victory from Team X, a role reversal from Round 1 and Gas'n'Go took an excellent 3rd achieving some of the fastest laps of the day.